Extremely tender, fragrant, extra-large, dark green leaves. An Italian strain, best for pesto. 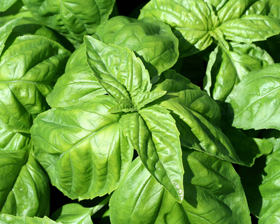 Basil is grown for its fragrant tasty leaves that can be added raw to salads, sandwiches or used in cooked dishessuch as the ever popular pasta with tomato and basil sauce. Basil should be grown in a position that receives a good amount of sunlight - around 6-8 hours a day. It can be grown indoors on a sunny windowsill or outdoors in containers or soil. Sow at any time if the plant is always to be kept indoors. If sowing outside wait until in March- May.